The genealogy of Castle Garden began in (1808) when it was first called the South-West Battery being used for military purposes. Castle Clinton. After the war, The South-West Battery was renamed to Castle Clinton in 1815 and was used the US Army. After six years, the US Army leased out the Castle Clinton to the City of New York and the name was changed once again to Castle Garden. During the time period of 1824 through 1854 Castle Garden became the center of public entertainment hosting concerts and education. Beginning in 1855, Castle Garden was leased by the State of New York establishing The First Official Immigration landing point in the United States. Castle Gardens provided the new immigrants opportunities for health care, employment opportunities and transportation. Castle Garden was the first step on American soil for more than eight million people fleeing from the troubled European countries. Castle Garden was closed in 1892 as the US Federal Government assumed responsibility for immigration building a larger facitily on Ellis Island. Castle Garden has once again been restored to it's former name of Castle Clinton becoming a National Landmark and under the jurisdiction of the National Parks Service. 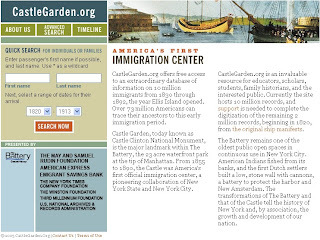 If you have ancestors that came to the New World between 1830 and 1890, there is a great chance that you will be able to find more information about them utilizing the Castle Garden's easily searched database. According to the site has over 10 million records and are currently needing to digitize 2 million more records. If you would like to search this site, please click here.